When it comes to Quick Service Dining in Disney World's Magic Kingdom, Cosmic Ray's Starlight Cafe is one restaurant that you just have to check out. Cosmic Ray's Starlight Cafe, which is located in Tomorrowland easily has the largest menu and the greatest variety of choices, making it easy to please everyone in your family. The restaurant is divided up into 3 different bays with a different menu available in each. There is seating found near each bay, as well as, a large dining area with entertainment. 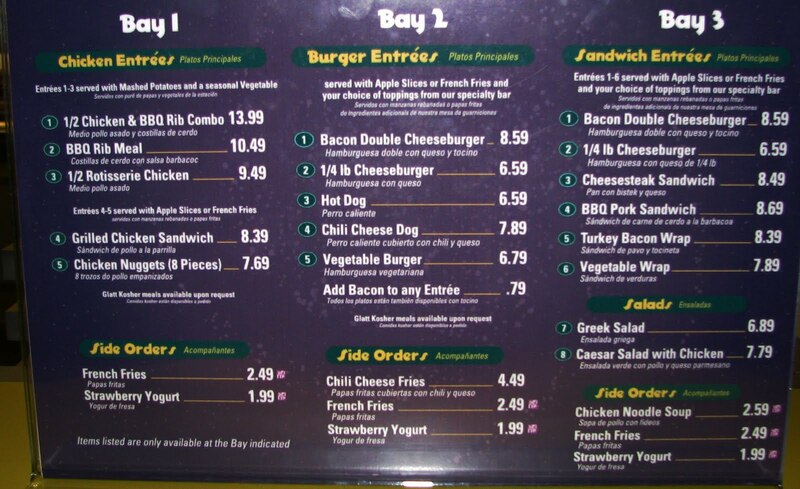 Shown in the picture above is Bay 2, where you can order and pick up from the counter Burgers and Hot Dogs. The full menu for all three bays can be seen in the picture above. Cosmic Ray's also features a Toppings Bar where you can add toppings of your choice to your Burgers or sandwiches. While you are dining you can be entertained by Sonny Eclipse. Sonny is an alien lounge singer that performs and tells jokes, like any good lounge singer, at the Starlight Cafe. If you catch his show you will hear his intergalactic take on some old earth favorite songs. It is an enjoyable show that provides entertainment while you dine. He is yet another amazing Disney World audio-animatronic character. If you are using the Disney Dining Plan then you definitely want to consider eating at Cosmic Ray's. For only one Quick Service Dining Credit you can receive the 1/2 Chicken and Rib Combo Meal ($13.99), Triple Chocolate Cake ($3.59) and a drink (~$2.19). This would normally cost $19.77+tax. This is certainly one of the best options for getting maximum value from your Dining Plan Credits. 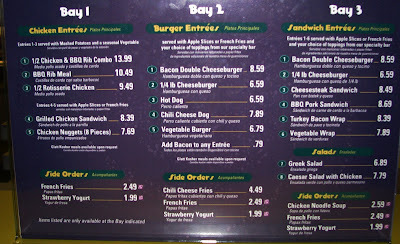 The large number of menu choices at Cosmic Ray's will help you find something for everyone in your family. Whether they are a big eater or prefer Vegetarian meals, there is something for them. It is also fun to listen to Sonny Eclipse and be entertained while you are dining. The entertainment makes Cosmic Ray's stand out from the other Quick Service Dining Locations. 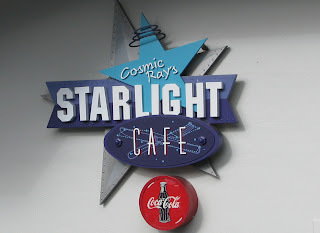 1 comments to "Disney World Dining - Cosmic Ray's Starlight Cafe"